Think all kitchen faucets are the same? Actually, there are more than one dozen styles of faucets, some that vary in how they work and others that vary in their design. Whether you're looking for a basic faucet or you want something that makes a statement, here are 7 styles to consider. Pull-out faucets are designed with a single handle that allows you to adjust temperature and water flow. There's also a built-in detachable spray head that pulls out of the faucet with a snake. This type of faucet is versatile and can make it easier to rinse dishes or get good pressure into hard-to-reach areas. Pull-down faucets are similar to pull-out faucets with a different design. This type of faucet has a head fixed into a downward position. The faucet head can pull down to extend the faucet a certain degree, but it doesn't have a free-range hose. You will have less flexibility, but a pull-down faucet is also less likely to make a mess. Single-handle faucets account for most kitchen faucets today, but you still have the option of installing a two handle faucet. This style is more traditional and works well in all types of kitchens, including modern and country. If you like the idea of controlling hot and cold water with separate handles, this is the style you want. If you love to spend time in the kitchen, a commercial faucet may be for you. These high-end faucets are designed for heavy use with features you won't find with other faucets. Commercial faucets are also great for making a statement if your sink is in the center of your kitchen or you have a chef's kitchen. Along with a solid design, this type of faucet typically includes a swing spout to move the nozzle as needed. Want a high-end faucet that stays clean? A touchless faucet uses motion detection technology to turn on automatically when you need it. Moen is currently the leading manufacturer of motion sensor faucets that allow you to turn the faucet on or off by waving your hand. Pot fillers are unique faucets with a body that rotates outward. Pot filler faucets are made to swivel out and go over large pots for fast and easy filling without the mess. Many pot filler faucets are wall-mounted, but not all. If you want to make a statement, a beautiful wall-mounted kitchen faucet is a great choice. A wall-mounted faucet can save space and make it easier to keep your sink area clean. These faucets come in many materials and styles ranging from vintage to sleek and modern. The main drawback to a wall-mounted faucet is you will need careful installation to prevent splashing. Can I Install a Kitchen Faucet Myself? Copyright 2019 by MrKitchenFaucets.com. 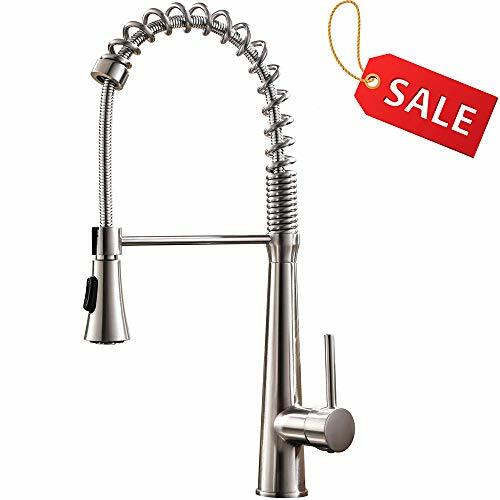 MrKitchenFaucets.com is a participant in the Amazon Services LLC Associates Program, an affiliate advertising program designed to provide a means for sites to earn advertising fees by advertising and linking to amazon.com.